Oregon Vesper Sparrow (photo by Rod Gilbert). Vesper sparrows are a large sparrow with pale brown- streaked plumage, white outer tail feathers, rufous lesser wing coverts, and a white eye-ring. The species occupies open habitats (grassland, shrub-steppe, and agriculture) across much of central and southern North America. The Oregon vesper sparrow is the rarest of four recognized subspecies and has a breeding range that extends from southwestern British Columbia through western Washington, western Oregon, and into the northwestern tip of California (Campbell et al. 2001, Jones and Cornely 2002, Altman 2003). This subspecies is migratory and overwinters from central California west of the Sierra Nevadas to northwestern Baja California, Mexico. A second subspecies known as the western vesper sparrow (P. g. confinis) is widespread in western North America, including eastern Washington (Jones and Cornely 2002, Mlodinow 2005). In Washington, the historical breeding range of Oregon vesper sparrows occurred in lowland areas and probably extended from northern Skagit County, the San Juan Islands, and Clallam County (Dungeness and Sol Duc) south through southern Puget Sound, and possibly Clark County (Figure 2; Jewett et al. 1953, Smith et al. 1997, Mlodinow 2005). Based on records from 1992 to the present, the current breeding population in Washington is now limited mostly to remnant prairies and grasslands in Pierce, Thurston, and Skagit counties, with smaller numbers on islands in the lower Columbia River and in grasslands on San Juan Island (Smith et al. 1997, Mlodinow 2005, Altman 2011). A few birds may also still breed in eastern Clallam County and near Shelton in Mason County. Migration season records since 1992 are scattered through all counties in western Washington except Pierce, Mason, Jefferson, and Wahkiakum counties (WDFW WSDM database). Declines of Oregon vesper sparrows are evident across the breeding range (Beauchesne 2006, Altman 2011). In Washington, the subspecies was originally described as “fairly common” to “rather abundant” in localized areas of western Washington (Altman 2011), but apparently was never common over a widespread area. It was reported as being of limited abundance and range by the mid-1960s (Larrison and Sonnenberg 1968) and as “rare and local….in remnant prairie areas” by the 1990s (Smith et al. 1997), with the exception of 91st Division Prairie on Joint Base Lewis-McChord, where about 100 singing males were on established territories in 1998 (Rogers 2000). The current Washington population is threatened with extirpation (Mlodinow 2005), and is estimated at 250- 300 birds in the Puget Lowlands and 50-100 birds on islands along the lower Columbia River (Altman 2011). Oregon vesper sparrows are present in Washington mainly from early April through late September, with relatively few records during other months (Mlodinow 2005; WDFW, unpubl. data). Most spring migration occurs from early April to early May. Fall migration is primarily from mid-August to late September, with fewer records extending into October. Birds begin singing after arriving at their breeding sites (Altman 2003). Singing occurs most frequently early in the morning and again from sunset to dusk (Jones and Cornely 2002). Singing is typically performed from elevated perches, such as fences, trees along the edges of fields, shrubs, grass, and the stalks of forbs, but may be conducted from the ground when perches are lacking (Jones and Cornely 2002, Altman 2003). Nests are made from grasses in the shape of a shallow bowl and have an outer diameter of 8-10 cm (3-4 in). Nests are placed on flat ground or in a shallow depression, and are usually located next to a clump of vegetation, crop residue, dirt clod, or at the base of a shrub or tree (Jones and Cornely 2002, Altman 2003). Oregon vesper sparrows nest from about late April to mid-July, with the few western Washington records reported from May 9 to July 7 (Bowles 1921, Altman 2003, Beauchesne 2006; WDFW, unpubl. data). Clutch size for vesper sparrows (including P. g. affinis) is usually 3-5 eggs (range = 2-6 eggs). Incubation averages 12-13 days and is performed mostly by the female. Young fledge from the nest after 9-10 days on average and remain dependent on the parents for another 20-29 days. Oregon vesper sparrows display some variation in breeding habitat. In western Washington, they were originally widespread in prairies and pastures (Jewett et al. 1953), but became restricted to the edges of open prairies by the 1990s (Rogers 2000, Mlodinow 2005). Clegg (1998, 1999) reported that all breeding territories (n = 23) at Joint Base Lewis-McChord were in areas of high quality prairie supporting intact Idaho fescue near prairie edge. Size of the prairie appears to be an important factor in site selection, with only large prairies occupied now. 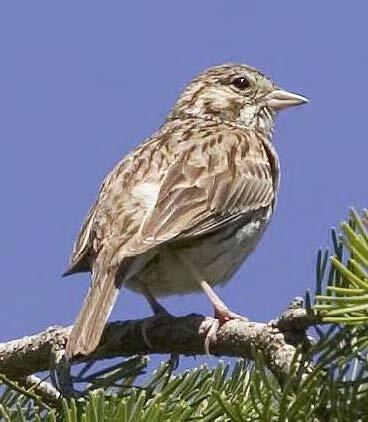 In Oregon’s Willamette Valley, nearly all detections of Oregon vesper sparrows are in young Christmas tree farms (i.e., 2-5 years after planting) with extensive grass and weed cover, or in lightly grazed pastures with scattered shrubs and grass heights of less than 30-60 cm (1-2 ft) high (Altman 1999, 2003). In southwestern British Columbia, breeding historically occurred in pastures, agricultural land, and airport fields with patches of grasses and weeds (Campbell et al. 2001), but the few remaining nesting territories are now present only in grasslands next to hayfields (Beauchesne 2006). Rogers (2000) reported reduced vegetation heights (average = 15-21 cm [6-8.5 in]) and densities at foraging locations compared to random sites in prairies in Washington. Population declines of the Oregon vesper sparrow likely result primarily from habitat loss and degradation, and potentially from increased predation and human disturbance (Smith et al. 1997, Altman 1999, 2003, 2011, Rogers 2000, Beauchesne 2006). South Puget Sound prairies originally covered an estimated 60,470 ha (149,360 ac), but had declined in size by 90% by the mid-1990s, with only 3% remaining in prairies dominated by native vegetation (Crawford and Hall 1997). During this period, the number of prairies in South Puget Sound fell from 233 to 29 sites and average size decreased from 260 to 175 ha (641 to 433 ac). This decline was driven by urban conversion, encroachment of douglas-fir forests caused by fire control, and conversion to farmland (Chappell and Kagan 2001). Many remaining prairies are degraded by the invasion of Scotch broom and other non-native plants. Oregon vesper sparrows also may be experiencing increased predation from species associated with semi- urban and residential areas such as American crows, domestic cats, raccoons, and opossums. Human disturbance from various activities in prairies, such as military training, dog field trials, off-leash dog walking and training, horseback riding, bicycling, hiking, model airplane flying, school field trips, prescribed burning, Scotch broom control, and other habitat management activities also may be disruptive or harmful (Rogers 2000). Habitat management. Although not the target of specific habitat management efforts, Oregon vesper sparrows nevertheless benefit from the ongoing prairie restoration work (i.e., control of Scotch broom and exotic grasses, and re-establishment of native grasses and forbs) being conducted to benefit other species of concern at a number of sites, including Mima Mounds Natural Area Preserve, Scatter Creek Wildlife Area, West Rocky Prairie Wildlife Area, Glacial Heritage Preserve, and Joint Base Lewis-McChord. In 2012, Thurston County (with funding from the U.S. Fish and Wildlife Service) began development of a Habitat Conservation Plan to reduce potential conflicts between listed and candidate species and future development activities in the county. Inventory activities. 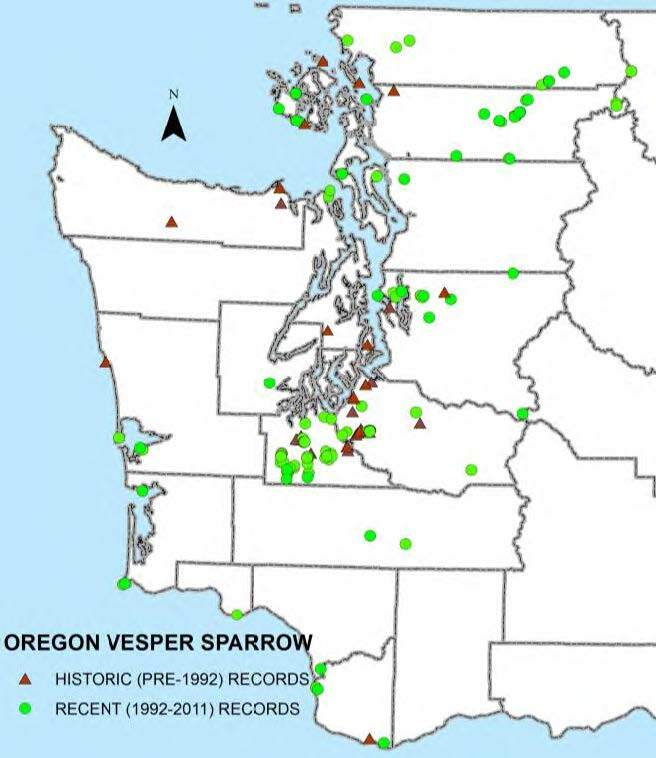 In 2012, WDFW compiled a listing of more than 330 Oregon vesper sparrow records for western Washington, which were incorporated into the agency’s WSDM database. Records were drawn from a variety of sources, including literature and unpublished sightings, and dated primarily from the 1970s to 2012. Partners and cooperators: Center for Natural Lands Management, Joint Base Lewis-McChord, American Bird Conservancy, Washington Department of Natural Resources, Thurston County. Altman, B. 1999. Status and conservation of grassland birds in the Willamette Valley. Unpublished report, Oregon Department of Fish and Wildlife, Corvallis, Oregon. Altman, B. 2000. Conservation strategy for landbirds in lowland valleys of western Oregon and Washington. American Bird Conservancy and Oregon-Washington Partners in Flight. Altman, B. 2003. Vesper sparrow Pooecetes gramineus. Pages 542-545 in D. B. Marshall, M. G. Hunter, and A. L. Contreras, editors. Birds of Oregon: a general reference. Oregon State University Press, Corvallis, Oregon. Altman, B. 2011. Historical and current distribution and populations of bird species in prairie-oak habitats in the Pacific Northwest. Northwest Science 85:194-222. Beauchesne, S. M. 2006. COSEWIC assessment and status report on the vesper sparrow affinis subspecies Pooecetes gramineus affinis in Canada. Committee on the Status of Endangered Wildlife in Canada, Ottawa, Ontario. Bowles, J. H. 1921. Breeding dates for Washington birds. Murrelet 2(2):8-12. Campbell, R. W., N. K. Dawe, I. McTaggart-Cowan, J. M. Cooper, G. Kaiser, A. C. Stewart, and M. C. E. McNall. 2001. The birds of British Columbia. Volume 4, passerines: wood-warblers through Old World sparrows. UBC Press, Vancouver, British Columbia. Chappell, C. B. and J. Kagan. 2001. Westside grasslands. Pages 41-43 in D. H. Johnson and T. A. O’Neil, managing directors. Wildlife-habitat relationships in Oregon and Washington. Oregon State University Press, Corvallis, Oregon. Clegg, M. 1998. The LCTA 1998 bird report. Fort Lewis, Washington. Clegg, M. 1999. Avian report, LCTA program 1999. Fort Lewis, Washington. Crawford, R. C. and H. Hall. 1997. Changes in the South Puget prairie landscape. Pages 11-15 in P. Dunn and K. Ewing, editors. Ecology and conservation of the South Puget Sound prairie landscapes. The Nature Conservancy, Seattle, Washington. eBird. 2012. eBird: an online database of bird distribution and abundance [web application]. Cornell Lab of Ornithology, Ithaca, New York. http://www.ebird.org. (Accessed: 24 Feb 2012). Jones, S. L., and J. E. Cornely. 2002. Vesper sparrow (Pooecetes gramineus). In A. Poole and F. Gill, editors. The Birds of North America, No. 624. The Birds of North America, Inc., Philadelphia, Pennsylvania. Larrison, E. J. and K. G. Sonnenberg. 1968. Washington birds: their location and identification. Seattle Audubon Society, Seattle, Washington. Mlodinow, S. G. 2005. Vesper sparrow Pooecetes gramineus. Pages 326-327 in T. R. Wahl, B. Tweit, and S. G. Mlodinow, editors. Birds of Washington: status and distribution. Oregon State University Press, Corvallis, Oregon. Rogers, R.E., Jr. 2000. The status and microhabitat selection of streaked horned lark, western bluebird, Oregon vesper sparrow, and western meadowlark in western Washington. M.S. thesis, Evergreen State College, Olympia, Washington.